Pics Another month, another successful SpaceX launch. This time, a Falcon 9 sent into orbit a twin set of communications satellites that eschew chemical-engine propellant in favor of solar power. Typically, half the weight of a satellite is its propulsion fuel, used to maneuver it into position once in space. However, the two just-launched Boeing 702SP birds each use a xenon ion drive, which electrically stimulates ions of the noble gas to generate small amounts of thrust. Each engine needs just a tenth of the fuel load of traditional satellite propulsion systems. As a result, the two lighter satellites (about 2.2 tonnes apiece) could be stacked for a single launch. The Falcon 9 can only carry a payload lighter than five tonnes to the birds' geostationary orbit 35,786 km (22,236 mi) above Earth – a distance first described by Arthur C. Clarke. 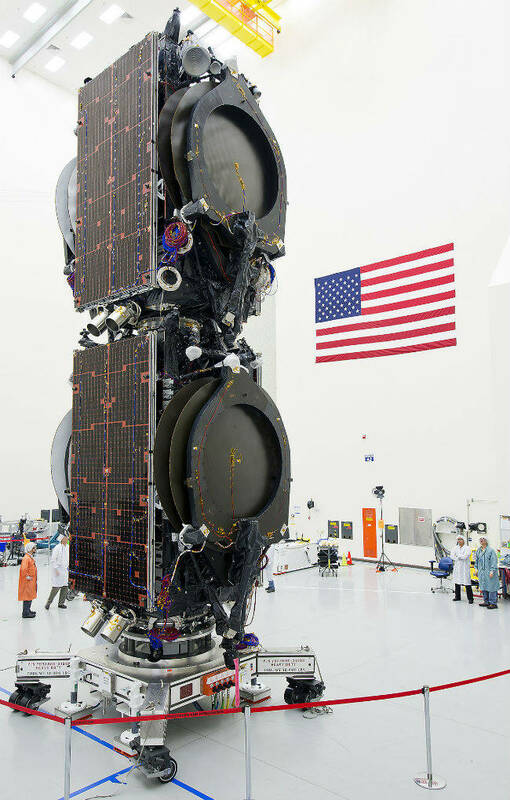 The satellites will be used to route internet and other communications around the world. On March 1 at 1050 EST (0350 UTC) the Falcon 9 rocket punched out from Cape Canaveral, Florida. After nine minutes of rocket burn, the lower first stage dropped away, leaving the upper second stage of the Falcon to take the satellites past low Earth orbit 35 minutes after launch. There was no attempt to land the reusable first stage of the rocket. While the satellite's ion engines might be thrifty, they are very slow, and it’ll take up to eight months to get them into position. Once there, however, the liquid-xenon fuel and 18kW solar cells can keep them in position for around 20 years. The twin satellites have split parentage. EUTELSAT owns one, and will deploy it over Latin America, Canada and Alaska. Bermuda-based ABS owns the other, and will use it for coverage of Europe and the Middle East with 48 x 72 MHz C & Ku-band transponders. "We are showing our lead to the industry. We have not only ordered two all-electric propulsion satellites, but also collaborated with Eutelsat to obtain a volume discount as our two satellites are part of a four satellite, two launch multi-party agreement we have negotiated with Boeing and SpaceX respectively," said Tom Choi, CEO of ABS. In financial terms, the low-weight electric satellites and SpaceX’s prices means ABS is only paying $30m and change for a launch. SpaceX is undercutting the Russians and Europe’s Ariane by somewhere between 25 and 40 per cent.